For the subject of acne, especially in teenagers, I want to talk about this from kind of a different perspective than what you’ve probably heard before. Most people are focused on some type of pharmaceutical drug or cleansing product for the face. I want talk about the mental and emotional connection of why a person might develop acne. Most of us have a little bit of intuition and can see the relationship between being really stressed out or having an emotional or mental condition, and how these things can play a role in your physical health. Some people are aware of that, others not so much. But I know when it comes to acne specifically, it has a lot to do with self acceptance and not feeling we’re good enough. The emotion of not accepting yourself can actually bring on skin conditions, especially acne. When you think about a teenager coming of age, they’re in high school, they’re really aware of their own ego, they’re thinking about how they look and whether people like and accept them. When they start to think negatively and think that they are or not good enough, they criticise themselves and don’t accept themselves. Acne will often start to show up as a result of that. Once the acne shows up, it typically gets worse, because they’re like “Oh my god, look at that pimple, that’s ugly, nobody’s gonna like me, everybody’s gonna see it”. That loops in the brain and they get caught up in a cycle of not liking themselves. Then the acne tends to spread and get worse, and it’s kind of a downward spiral. From the physical side of things, I have a face chart. When you look at this face chart, you can literally see that if there’s acne on the chin, it’s related to the reproductive system and even hormones. You can see if it’s on the cheeks, it’s related to the stomach. If it’s on the forehead, it’s probably related to the digestive system. If it’s between the eyebrows, it’s related to the liver. With this face chart, you can see if there’s acne that’s accumulating in one place. You can see which internal organ is out of balance. Another thing that’s changing for teenagers is that their hormones are going wild. Testosterone and estrogen and all sorts of other hormones are developing, and human growth hormone is a factor because they’re really starting to grow. These hormones can be thrown off by hormones that they’re actually eating. Now the only way to eat hormones is by eating pigs, chickens, cows, because these are animals that contain hormones. When you’re eating hormones from an exterior source, and your body’s producing all these hormones, it can be a bit much and hormonal imbalances start to create issues. I’m a big believer that if you need to radically cut back on animal intake and concentrate more on the plant kingdom, with phytoestrogens and things that help balance our hormones. Certain roots like ginseng and maca and different whole foods are great for balancing hormones. I believe that we need to look at energetically, mentally and emotionally accepting ourselves, loving ourselves, and even not looking in the mirror for 30 days. Another thing that I highly recommend is colon cleansing. I’ve got a product you can consume. You take about a tablespoon every two hours, five times a day for four days. And it cleans the entire digestive system out. If you have concentrated acne in one of these places, doing the colon cleanse allows all of the organs to detox. The next thing I would recommend is 30-60 days of a raw food plant based diet. That means that you’re eating fresh plants, fruits, vegetables, salads, smoothies, juices, nuts, and seeds and grains. 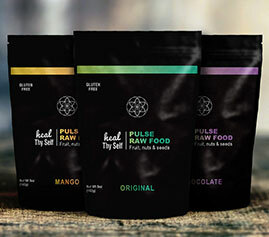 And in fact, I have a product that’s called PULSE Raw Food. This is a variety of nuts, seeds, roots and dried fruits in a perfect proportion to give the body all the nutrients it needs but also help the body to eliminate and balance hormones. The last thing I’m going to mention is actual skin cleaning. I make a product called Guasha. I don’t sell this product, I just teach you how to make it at home. It is bicarbonate of soda and alcohol. I have videos showing you how to mix these things and make it with a little bit of essential oils. You take that and scrub the skin with it. It opens up the pores and it is the most cleansing product on the planet. It’s very cheap to make at home. The last thing I’ll say is to make sure you’re getting into the sun. Developing vitamin D is good for the skin and balances your hormones. That’s gonna be a fantastic remedy right there for getting rid of any skin conditions at any age. You’ll be glowing after 60 days of doing this. You’ll be full of energy and mentally clear. I absolutely promise you that.